The Vertical Flight Society presents the Paper of the Month! The April Paper of the Month is now available – free for members: Challenges for Vehicle and Occupant Safety in Autonomous Electric Vertical Take-off and Landing (eVTOL) Vehicle Crashworthiness (17 pages), by Justin Littell, NASA Langley Research Center. This paper is from the proceedings of the 8th Biennial Autonomous VTOL Technical Meeting & 6th Annual Electric VTOL Symposium, sponsored by the VFS Arizona Chapter in January 2019. Are you a VFS member? Log in to receive	this month's paper absolutely free! Not a member? Check out the benefits of membership and consider joining today! Welcome to the Vertical Flight Library & Online Store! Current product count in the Library: 12500 items, with 12198 technical papers! We are constantly adding new items to the store, so check back often. The Vertical Flight Library includes downloadable papers from nearly all Forum Proceedings from 1943 to today, as well as papers from more than 100 Technical Meetings and 65 years of Vertiflite magazine! Note: the Journal of the AHS is hosted separately — please go to www.vtol.org/journal. The Online Store includes Forum and Technical Meeting proceedings CD-ROMs and USB drives, books and Vertical Flight Society merchandise that require shipping. Choose a department or use the search box above to find specific terms. You can also search our index of all available Forum papers. Note: if you are a Vertical Flight Society member and are not seeing the Member Price, please log in first. If you are not a member, why not join us? You'll receive special Members Only pricing and much more. Want unlimited downloads? Check out our site licenses! If you are from an educational institution or organization that already has a site license with the Vertical Flight Library (previously called the "AHS Online Store"), please visit your organization's start page before adding items to your shopping cart. The Vertical Flight Society is the global resource for information on vertical flight technology. NEW: Check out the latest addition to the Vertical Flight Library! 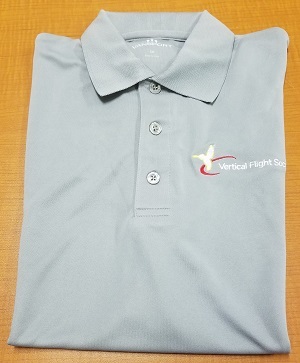 Grey Polo Shirt - 2XL, Grey Polo Shirt with VFS logo. (Added to the VFS Library on Apr 22, 2019). Are you a VFS member? Log in to receive the member price of $38.00 on this item! Not a member? Check out the benefits of membership and consider joining today!